Ok Guys, I need you to EMAIL me How many shirts you want.. and what sizes you want. Right now I am going with Black with Silver lettering... If you want another color I'll have to talk with the Tshirt Company but It shouldn't be an issue. The front of the shirt will be The Rally North America Logo with the Blue Road... (will be red on the black shirt) with the Caption... Get In and Drive under it. 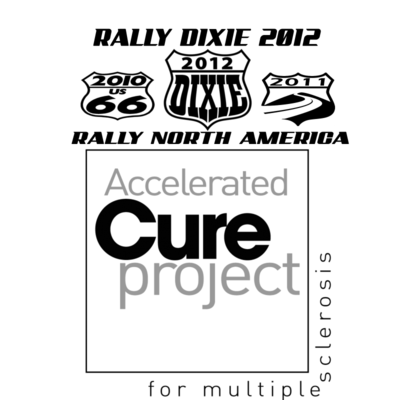 The back of the shirt will be as pictured below.. with the three logos and the ACP logo. Cost is $25.00 for M, L, XL and $27.00 for XXL. When's the cut off for the pre order? I'll be doing this on a continual basis... so... really no cut off, when I get enough to go ahead and start making them... then I'll start shipping when I get them back. Rob and I will be down for a couple again this year. Hmmm. Mine hasn't arrived. Did you send it, Scott? I sent it out about hmm three weeks ago :(. Already sporting mine. true to size and no shrinking. I've yet to get mine as well. Can you email me your address? Are you still taking orders for round 2? Crap, I've been busy as crap lately and completely forgot about getting in for ours. I'll shoot that to you here directly Scott. I'll Get yours and Doc's out this week. I have been busy with the decals, so I apologize. Scott, can I still order a few more shirts? Not a problem buddy. I understand you've got alot on your plate at the moment. We all appreciate the hard work you guys are putting in. I received the t-shirt today in perfect condition. Many thanks! Got mine today as well. I'll be sending you payment for another one soon. Tina is wanting one too now.